Good morning, my stampin' sistahs! Today's card features Jillibean Soup papers from the Cool as a Cucumber Soup collection. Layer and adhere orange cardstock panel and patterned paper panel to card. Die cut box from patterned paper and orange cardstock. Remove patterned paper box tops and replace with cardstock box tops; adhere box to card with foam dimensional tape. Fold tissue paper and adhere. Adhere dog die cut with foam dimensional tape. 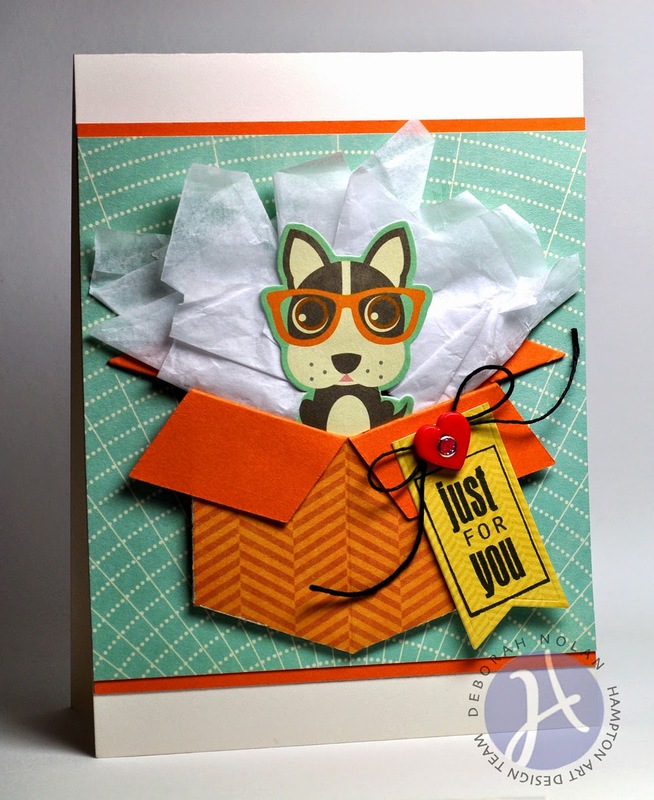 Die cut tag, stamp sentiment, and adhere with foam dimensional tape. Thread button, tie bow and adhere button bow-side-down with glue dot. Adhere sparkle sticker in center of heart. Oh my goodness Deborah, I love this card so much! Crazy cute idea! !